It's an article published by Juanjo Navarro in "More than Code". He doesn't tend towards specific software, but he analyzes why public administration is not prepared to take on a whole migration to free software. He exposes plainly business role in software development. We are improving K-Government. 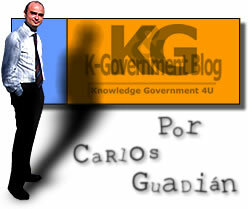 Since this weekend you can read K-Government in Catalan, and also in English and French. I want to remind you that you have the possibilite to syndicate with feedburner or you can add the feed in My Yahoo or News Gator. Of course, in K-Government you can find a whole blogroll about egovernment blogs classified in countries. I hope it will be usefull and you recommend it to everyone who are interested in it.